One thing is for sure: With Chinese worker discontent growing, the melee that shut down a Foxconn plant won’t be the last. Quickly disappearing from China’s tightly controlled internet are disturbing pictures of Sunday night’s riot at a Foxconn factory in northern China: broken glass, overturned cars, fires and long lines of law enforcement officers in paramilitary gear. 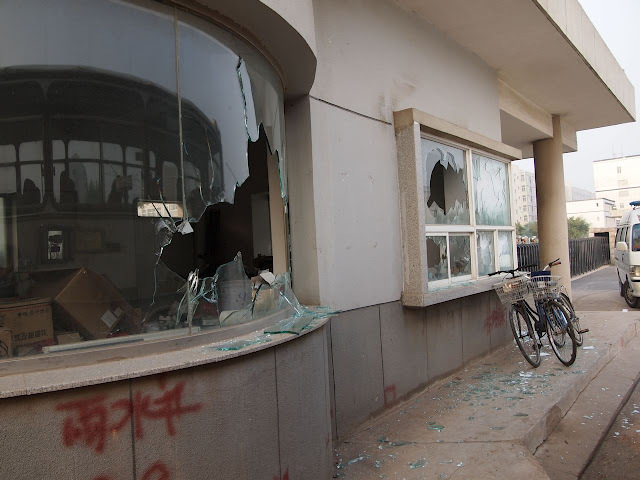 The Chinese internet is now abuzz with questions unanswered, chiefly: how did a skirmish among a handful of workers (and possibly hostile guards) escalate into a full-blown riot and factory shut-down? And did stress leading up to the release of the iPhone 5 contribute to worker rage? 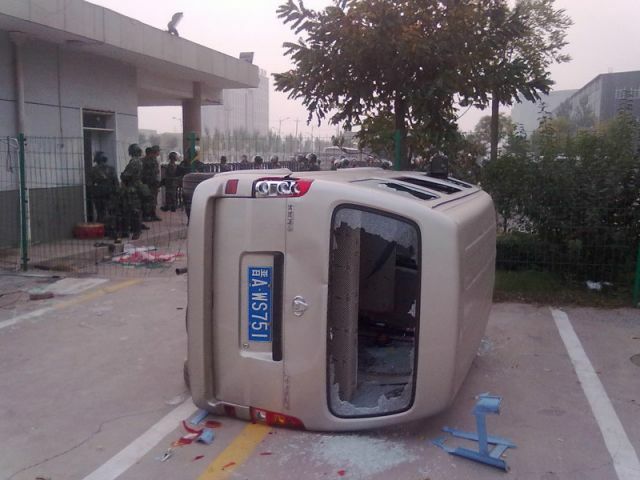 This is what we know from official and company sources: Forty people were injured, three seriously, when 2000 workers rioted at a Foxconn plant in the industrial city of Taiyuan, lasting several hours into the morning. Foxconn, a key supplier to the world’s biggest electronics companies including Apple, has now shuttered the sprawling complex that includes factories and dorms and employs 79,000 workers; investigations are on-going. A massive deployment of 5000 local police was required to quell the riot, which started at 11pm and lasted until at least 3am. But these accounts provide precious little by way of context or motivation for the riot. State-run Xinhua news agency says a dormitory brawl sparked by an inter-provincial rivalry broke out between workers from different parts of China. Plausible, but enough to spill over into the general population? 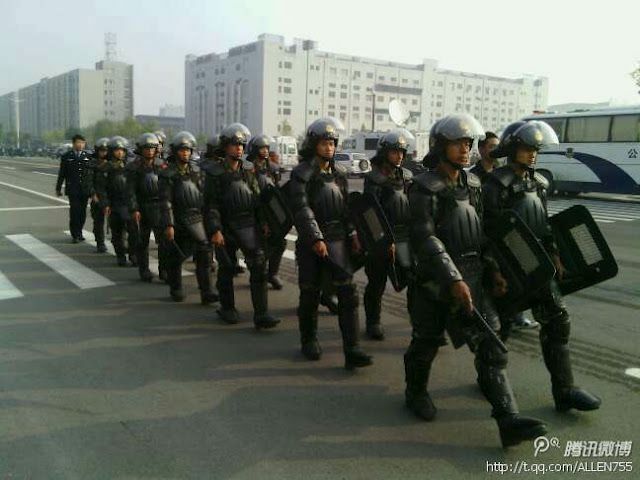 On blogs and on China’s Twitter-like microblogging service Weibo, some said the riots were started by the company’s security officers. 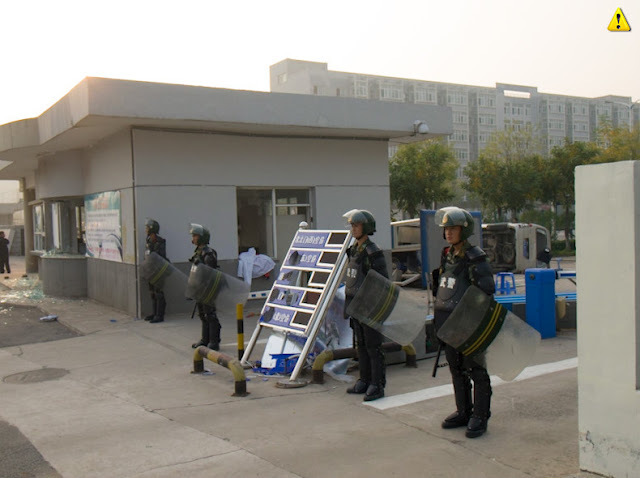 China Labor Watch, a workers’ rights group based in New York, released a statement saying guards “reportedly dragged [a] worker into a van and began beating him.” That, they said, snowballed into a large-scale fight between workers and and guards as workers sought retribution. Photos on this page were curated from social media by China Jasmine Revolution, a Chinese-languge activist website. In a statement provided to CNet, Foxconn said the factory would re-open on Tuesday. The company also said there had been no deaths related to the incident. According to a local trade website, the factory in Taiyuan produces magnesium alloys, LED lighting systems and electronics. Though unconfirmed by Foxconn (the company does not give out information about what is made, where it is made, and for whom), China Labor Watch says workers at this Foxconn plant are responsible for producing components for the iPhone 5. (A report by a Chinese journalist says the factory produces back plates for the new phone). “Why is it that it’s so easy for 2000 workers to devolve into such a situation?” asked Kevin Slaten, a spokesperson for China Labor Watch. “This is not something that just happens at any factory in China… The stress in a lot of factories—especially when they are producing iPhone 5 and new products—is extremely high.” He called the work environment “militaristic”. Apple did not reply to a series of questions this afternoon about the incident. Foxconn says it employs over 1 million workers in China, and is crucial to Apple’s supply chain. This latest incident comes despite Foxconn—with Apple’s public prodding—vowing to revamp their workforce by cutting work hours, increasing pay and improving living conditions. Workers went on strike at the same facility in March, apparently over pay conditions. Engadget reports that Foxconn’s Chengdu plant also had a riot in June, due to an argument between workers and a local restaurant owner. But these protests rarely get any attention; information about them is aggressively suppressed in the Chinese media in favor of demonstrations that foment nationalistic fervor, most recently around the diplomatic stoush with Japan over contested islands. One thing’s for sure, in the lead-up to the all-important, but super-tricky transition of power from President Hu Jintao next month, we’ll be hearing a lot more about the chest-beating protests over disputed islands from the Chinese government, and not much about workers in Foxconn factories.